After an MOT fail on rear brake imbalance it appeared a full tear-down of the rear brakes was needed. While the braking was good, the rollers in the MOT station were not happy with one side being well out of balance and the handbrake being similarly (but oppositely) affected. I'd previously replaced the brake shoes and the adjusters, so my suspicion was that the rear cylinders had rusted internally. This was borne out by the presence of a fair amount of rust particles in the fluid when I bled them. Removing the cylinders was complicated by them being rusted onto the original steel brake lines and with no possibility of removing them without damaging the lines I felt it best to replace the whole run from the master cylinder to the rear wheels. It's worth taking a bunch of photos of where the lines run - especially their route over the rear axle and around the various brackets - as the replacement lines are cut to the specific length any difference in the route can mean you don't reach the wheels. 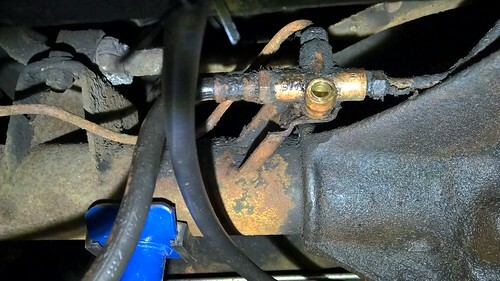 Also worth noting that (at least on the later dual-line systems) the thread at the master cylinder is different to the one at the first connector - not realising this meant I had to order a new line, dammit. Anyway with new copper lines in place and new cylinders and 3-way connector (the old one was solid to the flexi-line), the car sailed through the MOT and as a bonus I have a very effective handbrake, one that will hold the car on a steep hill. First time I've had that!